Affordability, a backyard and a safe neighbourhood are three key priorities for Australian homebuyers in 2016. New research from Westpac shows that 80% of homebuyers believe staying within budget is the most important element of purchasing a new home. A safe neighbourhood was the second most desirable trait of a home with 66% of respondents saying this was important to them, while 51% stated that a backyard is desirable. The results indicate the priorities of homebuyers in 2016. 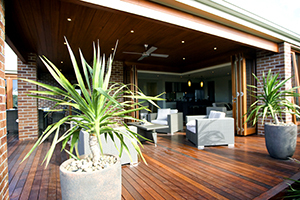 In the modern budget conscious age, the lifestyle and safety of the suburb and a backyard is particularly appealing. Affordability remains a concern for the majority of homebuyers. This often results in compromise with either the location or the property itself. Interestingly, features such as a modern kitchen dropped in popularity by 9% over the last year, suggesting people are willing to sacrifice the quality of the home for the extra space in the backyard and more desirable location. When deciding on a neighbourhood, safety is the number one consideration (66%), peace and quiet was second (55%) and access to public transport (39%) was the third most important factor. The research also found that different features matter to different buyers. Those who are planning a family value affordability within budget (84%) and long-term investment opportunity (66%) whereas those approaching retirement are more interested in off-street parking (70%) and finding a property that is move-in ready (38%).